I'm back. Just like Jesus, when he rolled the stone from his tomb and said, "Wassup, my beautiful babies?!" I have returned. I hope you had a good week. Let's do some housekeeping. There may be some copies of The Jerx, Volume One available over the coming months. There are a few reserved copies that could become available again. And I may release a couple from my personal vault. Like the way Disney used to release Pinocchio on VHS every ten years. I would say, "Don't hold your breath," but if you're interested in a copy if one becomes available there is a little form on the "Buy the Book" page. When and if any become available, I'll go through the people who signed up there. Regarding some PDFs I mentioned in the past. Pixelated/Pixilated will be going to GLOMM elites at the end of this month. Wanda Disney is being rolled into The JAMM #4. 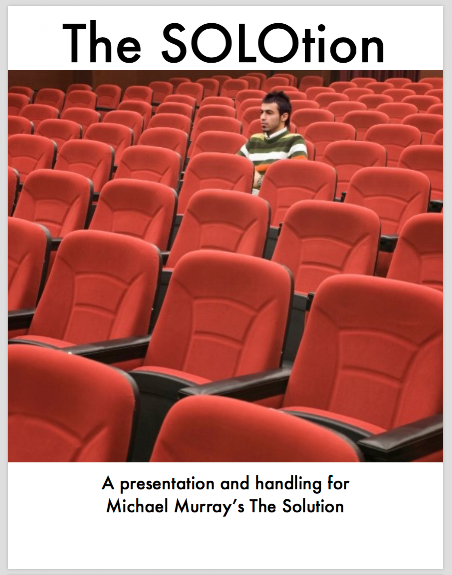 I wanted a one-on-one variation of Michael Murray's The Solution because I don't tend to perform in groups too often. The ebook below contains my handling/presentation which is fairly similar, but which is designed to play for one spectator. "Note: As you demonstrate the turning procedure, be sure to ______"
In the last post I mentioned Michael Weber's Charge Card effect and Marc Kerstein's app that goes with it. Michael informs me the cards are still available. For $30 you get two cards and illustrated instructions. Write to Psience.Mail@gmail.com if you're interested. Marc's app is available here. Although you can use the effect without an iphone/Marc's app, I prefer to use them together. As I said in that post, this isn't a good magic trick. But it is an interesting moment of almost-possible seeming technology that people find fascinating. I will sometimes ask a stranger to rub the card on her sweater. Then I'll use the charge she captured to charge my phone. Does anyone recognize what these cards are in the Ratatat video for Pricks of Brightness? Magic ads make a lot of bold claims, but are any so inaccurate as this one I found on Penguin? If the apostrophe in "liner's," the cover illustration, or the "Certified Funny" ribbon don't depress you, the music and "jokes" in this video will. Don't watch if you suffer from suicidal ideation.